A longstanding member of Transition Tynedale since its inception I am now residing in Catton while my husband works in the far east. I helped start the community gardens at no 28 and HMS, the garden share scheme and the Farmers market stalls. I now work mainly with Edible Hexham to show people how easy it is to grow their own veg.even in small spaces. This day is an annual event at the Farmers Market. Every year TT are invited to participate and we hold an apple pressing stall. Some of the juice produced is given away to shoppers and the surplus ( if any! ) bottled to drink later. This year we intend holding the stall again – so please start collecting your surplus apples and empty plastic bottles to put the juice in. Windfalls are welcomed – any variety – cookers and eaters – as they will be mixed and crushed together. Bring your windfalls and turn them into delcious juice! For fruit foragers – the Tynedale Fruit Map ! 2016 promises yet again to be a bumper year for fruit and yet again a lot of this will not be harvested and go to waste unless picked and processed. To encourage people to find and harvest the fruit trees we are planning to map the location of all fruit trees on public land, beside roads etc – anywhere that people are welcome to collect free fruit. Do you know of any ‘wild’ trees or trees on public land that are freely accessible? If so please send details of the type of fruit and location and we will enter it on a google map for all to see. Fruit can include apples and pears, crabapples, damsons, sloes etc but not blackberries, mushrooms etc . Many thanks and happy foraging ! This year we are teaming up with the North Pennines AONB and featuring not only the usual edible plants but also those which are attractive to bees, moths, butterflies and other pollinators. Gardeners – don’t throw away all those surplus tomato seedlings – swop them for another variety or try something completely different ! 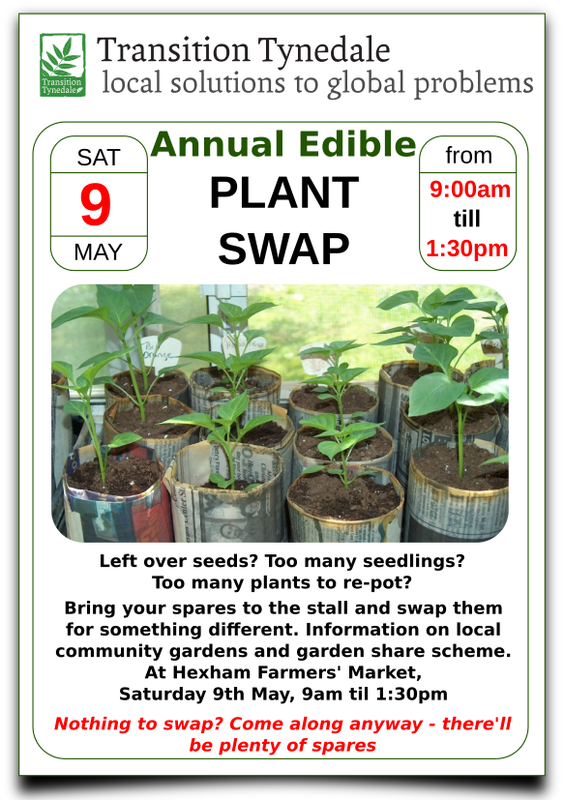 Please bring any spare veg, fruit or flower seedlings to the stall to swop. Trees and wildflowers also welcome –it’s surprising what turns up ! 2016 is United Nations International Year of the Pulse. We are particularly keen on having plants and seeds of these to swap and we will have seeds available. If you have nothing to swop but want advice and plants to start growing your own – this is the place to come ! Many household have now received notices about buying a ticket for your brown bins for garden waste from the council. But why not compost your own waste ? Not just garden waste but also raw vegetable and fruit waste from the kitchen – and feed your homegrown fruit and veg with the results ! This is the website to order home compost bins from the council. – ‘Dalek’ style bins, plus wormeries and accessories. 220l ‘Dalek’ bins start at 17.98 + delivery Bins are made of recycled plastic. The website includes full instructions for easy composting. ‘Green plugs‘ from http://www.green-plug.co.uk These are plugs designed to switch off automatically things left on standby too long and claim to save up to 41% of individual appliances consumption. This device controls heating and hot water temperature from an app on your phone or computor. Remote control is supposed to save up to 150 pounds / year for the average household. Loop energy saver app – this personal energy assistant monitors your energy use throughout the day. Energy saver app – calculates the full statistics for your annual or daily consumption and gives tips on saving energy. British gas app to compare your consumption with other similar houses in the neighbourhood. Hopefully your house will be in the highest ‘smug mode’ ! There are moments in history when the very act of people coming together can force change. Sunday 29th November, the People’s Climate March, could be one of those moments. In just over three weeks’ time world leaders are coming together for the biggest climate meeting of the decade – the Climate Summit in Paris. The day before they meet, people across the globe will take to the streets. It’ll be the biggest climate march in history – aimed at convincing politicians to do what’s needed. It’s a huge task to drown out the lobbying power of the super-rich dirty coal and oil industries. Which means thousands need to hit the streets. Will you join too ? Transition members have a strong track record of coming together to protect our environment. We’ve been fighting battles one by one. But this is a huge global moment and all concerned citizens need to come together. This global march is one such moment. -marching at 2.00pm to an open air meeting at the Civic Centre. Please invite everyone you know. Photos of our event will be beamed to Paris, along with those from many other countries. For the sake of our children, grandchildren and theirs.! Edible Hexham : As the season draws to a close many thanks are due to the stalwart few who maintain the various planters and beds around Hexham. They have looked ( and tasted !) good all year and we have had many favourable comments by visitors and locals alike. We are now making plans for 2016 so if anyone has ideas for new areas to plant, or would like to help in any way then please get in touch – we need you ! We already have several areas in mind and a generous grant to share with other food related projects. We need people to plant and maintain small areas and also to help publicise our work – one of our aims is to show how easy it is to grow your own food and to think about buying local produce before dashing to the supermarket. For a full report on the years activities please see minutes of the latest meeting attached below. To volunteer in any way please email Sue or Rosemary at info@transitiontynedale.org. Plant stall – seeds and seedlings wanted !